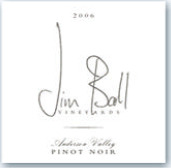 Chicago attorney Jim Ball has a love for Pinot Noir and the Anderson Valley. He bought land in Anderson Valley in 1999 and built a 10,000-case winery on Highway 128 across from Goldeneye Vineyards. He ran the winery with his long time assistant Tanya Wilber. Beginning in 2002, he began a staged planting of Pinot Noir vineyards totaling 44 acres include a remote vineyard in the Anderson Valley named Middleridge Ranch and the Four Dog Ranch Vineyard adjacent to the winery. Greg LaFollette was involved initially and made the 2006 vintage, but has since departed. Ball then brought biodynamic viticulturalist, Ginney Lambrix, to supervise vineyard development, maintenance and winemaking. 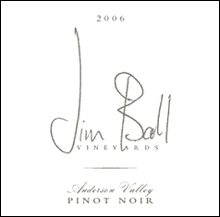 The 2006 Jim Ball "Signature" Anderson Valley Pinot Noir was introduced at the 2008 Anderson Valley Pinot Noir Festival. The wine won Double Gold at the San Francisco International Wine Competition. A second bottling, labeled "Boonville" was also available, and a third bottling, "Les Pintades," was added in 2009. 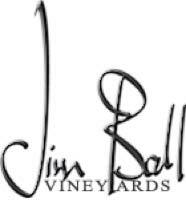 **CORRECTION It was incorrectly stated here that Jim Ball Vineyards was sold to Champagne Louis Roederer. 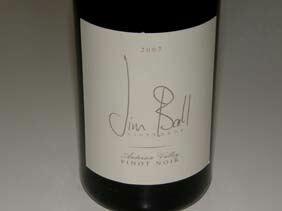 Neither the trademark Jim Ball Vineyards nor the corporation Jim Ball Vineyards, Inc., were ever sold to Roederer. The corporation is still privately held by Mr. Ball, the label is still owned by Jim Ball Vineyards, Inc., and the trademark is still owned by Mr. Ball and Jim Ball Vineyards, Inc.. The Four Dog Ranch in Anderson Valley associated with Jim Ball Vineyards, Inc. was sold in 2011. In late 2014, two wines were released crafted by noted winemaker Greg La Follette: a 2013 Signature Russian River Valley Pinot Noir and a 2013 Signature Mendocino Ridge Chardonnay.